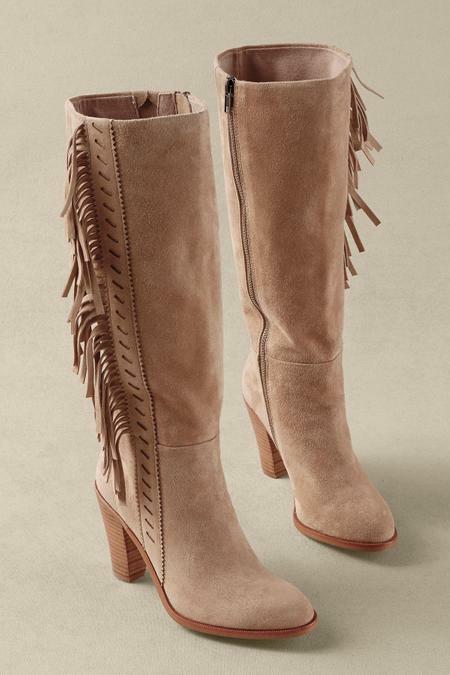 Lavishly soft suede boots are the essence of refinement with totally up-to-the-minute styling, including a luxuriant band of fringe flowing along a lacy laser-cut strip and a contrasting exposed antique brass zipper. Feet appreciate the fabric and suede lining, comfy padded insole and manmade sole. A stately 3-1/2" stacked wood heel completes this elegant, exceptionally chic boot. Shaft height 14”, shaft opening 15”.